On Kubuntu 16.04 and 18.04, you can insert a custom MAC Address into a certain Wifi Hotspot connection right within the NetworkManager tray. For example, if you always connected to --let's call it-- @wifi.id hotspot on the wifi.id public places, you want to connect with a custom MAC address, then this tutorial is for you. This article discusses the tactic to make you able to use MAC as an account ("seamless" service) on public wifi places. The goal is for you to not manually change MAC every time you connect to that hotspot. Just configure once, use forever. Happy connecting! Before: in your home, first, insert the MAC address into NetworkManager. After: in the public hotspot, just let your Kubuntu connect to the hotspot and your MAC-account to be accepted. Next time, you do not need to change anything again in your home because NetworkManager remembers your settings. In this tutorial, I use an example of @wifi.id hotspot (SSID) in the wifi.id corner (public hotspot place) from Telkom Indonesia (ISP) I find in my country. Open up your NetworkManager from your tray. 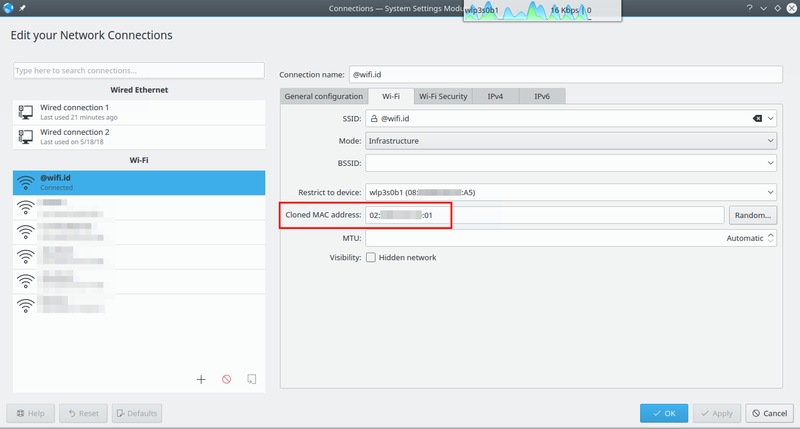 Click the Configure button to show Network Configurations. You find there the name of hotspot you usually use: @wifi.id. Open up the hotspot name "@wifi.id". Insert your custom MAC address into Cloned MAC Address field. Go to your public wifi place and connect to the hotspot name "@wifi.id". 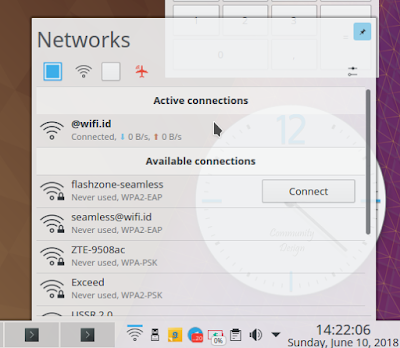 If everything is OK, you will have a successful connection to the @wifi.id hotspot Access Point. To check the MAC address, see the Network Configuration again if the Cloned MAC Address is there. Connected to the hotspot with a custom MAC! With this command, in the output, you will see special URLs of your hotspot provider and if your MAC address is an account to seamless service, you will see URL showing acceptance to your MAC account. Happy browsing!